Why I’m Not a “Social Justice” Warrior: What About Non-Drinkers’ and Short Peoples’ Pay and Representation in the Workforce? Previously, I mentioned declining to post certain third-party submitted content at this blog. I’m sure it raises eyebrows whenever I reject content promoting, say, women in the workplace. So I thought it best to explain why I’m not making noise about race and gender instead of leaving this open to speculation. Ever since I’d invited content submission on my blog, I’ve appreciated all the wonderful submissions covering topics related to my blog that I lack the expertise to write. I read through all submitted articles and am selective about what appears here. Yes, I’m still here and I plan to do something different on this blog this year. I began this blog focusing on the matter of telework (otherwise referred to as “remote work” or “virtual work”) as it was an exciting concept I wanted to promote. Since then, I’ve learned about obstacles to adoption and the fact that some large organizations that initially embraced it decided to call their remote workers back onsite. The following content, provided by Circa Interactive, was approved by me. The integration of military personnel into the civilian workforce is an important matter and so I share this in recognition of the United States’ Air Force’s birthday, today, September 18th, 2017. Today is the United States’ Air Force Birthday. This day is meant for celebrating this branch of military and the brave work they do for our country, but it is also a prime opportunity to take a look at what needs to be done to help these soldiers make a successful transition from active military to civilian life. The need to ease that transition is as relevant as ever today — in 2015, there were approximately 1.46 million active U.S. military personnel. According to a survey conducted by the Pew Research Center, up to 27 percent of veterans experience considerable difficulties when returning to the workforce. The proportion is much higher for veterans who served in the military in the ten years following the 9/11 attacks. So what can be done to make a transition from active military to civilian life successful? What Skills Do Veterans Bring Back into Civilian Life? If this content seems odd and off-topic, bear with me as I tie this to my blog’s subject matter. Autumn always draws my attention to the fact that the year will soon end. When this year ends it’ll be 9 years since the Great Recession began. Can you think of many places that have scarcely recovered after all these years? Let me know. As for me, the still bleak economic condition of my hometown of Redding, California always sticks out. Despite a prevalent impression that there’s nothing to see or do here however, Redding has notable points of interests. Turtle Bay is one of them. During tough times, Turtle Bay continued to adapt and improve operations, including the current transition to a more sustainable business model. If any of you plan to visit Northern California or just pass through, consider giving Turtle Bay, and Redding, your patronage. This story showcases the staff’s devotion to their non-human residents but they also stress that wild animals belong in the wild. During my break, I’ll primarily focus on some practical life concerns. Secondly, I aim to (1.) work on publications which will be added to the new “My Publications” page and (2.) focus on my piano project (which has fallen by the wayside). Updates on these endeavors will be provided when I return in late June 2016. Coming upon 3 years of blogging, I’d like to address feedback I’ve received. To the readers who’ve told me that I have interesting, unusual thoughts, I want you to know that I especially appreciate hearing this as I never thought that I’m unique enough to stand out so much amid the throngs of people you’ve met across various corners of the world. Your feedback means a lot to me! To bloggers I’ve been following closely, I’ll be following and responding to your posts as always. No changes here. To others, you can reach me on LinkedIn, Twitter, or via email: ltpatra@gmail.com. Currently, I’m open to new professional opportunities, so inquiries are welcome. Comments on this blog will be closed on December 1st, 2015 and reopened when I return. Thank you for reading and Happy Holidays! The Attention Deficit Disorder Association (ADDA) is conducting an online (short) survey about ADHD issues in the workplace, so I thought I’d share. They’re hoping to get 1,000 completed surveys by June, but the more we can submit, the better. The ADDA will use the results to create an ADHD awareness publicity campaign to help educate the general public and employers about potential ADHD workplace issues and hopefully, potential solutions. The survey is geared toward adults with ADHD that are (or have been) employed. I urge you guys to take a few minutes to complete it. I promise it won’t take long. This is important stuff. The more completed surveys, the better the data. You can read a little more about the survey in this ADHD Coaches Organization Circle or jump right to the survey here. 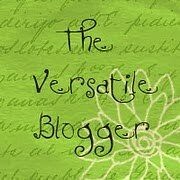 Tonight I’d like to take the time to express my appreciation to Christian at http://fivequickminutes.wordpress.com for recently naming me as a recipient of the Versatile Blogger Award. As a relatively new blogger, it’s a real honor to be recognized by others in the blogging community. My thanks to Christian and others who’ve encouraged me along the way! Futhermore, I just want to mention that Christian’s blog, Five Quick Minutes: Just Five Minutes On the Path for Learning, contains helpful and thought-provoking information covering various aspects of life. So, head on over and take a look soon! This is a general announcement to notify readers that a comprehensive list of links to research studies, scholarly articles, white papers, and various documents covering on this blog is now available. As stated on the Source Materials page, I will continue to update this list as I find more material. So check back if you don’t find what you’re looking for or feel free to make requests and I will see what I can find.